ORCID number: Mi Jung Kwon (0000-0002-3484-6595); Ho Suk Kang (0000-0002-3808-2385); Hyeon Tae Kim (0000-0003-4014-5004); Jin Woo Choo (0000-0003-3339-4969); Bho Hyeon Lee (0000-0002-4812-426X); Sung Eun Hong (0000-0002-6543-1165); Kun Ha Park (0000-0002-5937-9006); Dong Min Jung (0000-0002-9512-9565); Jae Seung Soh (0000-0003-1594-6029); Hyun Lim (0000-0001-6581-6420); Sung Hoon Moon (0000-0003-4728-842X); Jong Hyeok Kim (0000-0002-4205-1397); HR Park (0000-0003-3471-7360); Soo Kee Min (0000-0001-9156-9427); Jin won Seo (0000-0003-4358-6921); Ji-Young Choe (0000-0001-7967-8487). Author contributions: Kwon MJ and Kang HS designed the study, analyzed the data and drafted the manuscript; Kim HT, Choo JW, Lee BH, Hong SE, Park KH, Jung DM collected the data; Soh JS and Lim H revised the manuscript for important intellectual content; Park HR, Min SK, Seo JW, Choe JW and Kwon MJ reviewed the pathologic slides; Moon SH and Kim JH supervised the study; all authors have read and approved the final version of the manuscript to be published. Institutional review board statement: This study was conducted with the approval of the ethics committee of Hallym University Sacred Heart Hospital in Anyang, South Korea. IRB No. HALLYM 2018-01-003-001. Conflict-of-interest statement: All authors declare no conflicts of interest related to this article. Gastric ‘indefinite for neoplasm/dysplasia’ (IFND) is a borderline lesion that is difficult to diagnose as either regenerative or neoplastic. There is a need for guidance in the identification of a subset of patients, who have an IFND lesion with a higher risk of malignant potential, to enable risk stratification and optimal management. To determine the clinical and pathologic factors for the accurate diagnosis of gastric IFND lesions. In total, 461 gastric lesions diagnosed via biopsy as IFND lesions were retrospectively evaluated. Endoscopic resection (n = 134), surgery (n = 22), and follow-up endoscopic biopsy (n = 305) were performed to confirm the diagnosis. The time interval from initial biopsy to cancer diagnosis was measured, and diagnostic delays were categorized as > 2 wk, > 2 mo, > 6 mo, and > 1 year. The IFND lesions presenting as regenerating atypia (60%) or atypical epithelia (40%) at initial biopsy were adenocarcinomas in 22.6%, adenomas in 8.9%, and gastritis in 68.5% of the cases. Four clinical factors [age ≥ 60 years (2.445, 95%CI: 1.305-4.580, P = 0.005), endoscopic size ≥ 10 mm (3.519, 95%CI: 1.891-6.548, P < 0.001), single lesion (5.702, 95%CI: 2.212-14.696, P < 0.001), and spontaneous bleeding (4.056, 95%CI: 1.792-9.180, P = 0.001)], and two pathologic factors [atypical epithelium (25.575, 95%CI: 11.537-56.695, P < 0.001], and repeated IFND diagnosis [6.022, 95%CI: 1.822-19.909, P = 0.003)] were independent risk factors for gastric cancer. With two or more clinical factors, the sensitivity and specificity for carcinoma were 91.3% and 54.9%, respectively. Ten undifferentiated carcinomas were initially diagnosed as IFND. In the subgroup analysis, fold change (5.594, 95%CI: 1.458-21.462, P = 0.012) predicted undifferentiated or invasive carcinoma in the submucosal layers or deeper. Diagnostic delays shorter than 1 year were not associated with worse prognoses. Extremely well-differentiated adenocarcinomas accounted for half of the repeated IFND cases and resulted in low diagnostic accuracy even on retrospective blinded review. More than two clinical and pathologic factors each had significant cut-off values for gastric carcinoma diagnosis; in such cases, endoscopic resection should be considered. Core tip: At initial biopsy, ‘indefinite for neoplasm/dysplasia’ (IFND) lesions proved to be adenocarcinomas (22.6%). Independent risk factors for gastric IFND cancer were age (≥ 60 years), endoscopic size (≥ 10 mm), single lesion, spontaneous bleeding, atypical epithelia, and repeated IFND diagnosis. Additionally, fold change predicted undifferentiated or invasive carcinoma in the submucosal layers or deeper. However, diagnostic delays shorter than 1 year were not associated with worse prognoses. In summary, for IFND lesions with these features, endoscopic resection may be a better option than repeated endoscopic biopsy. In the absence of associated risk factors, accurate diagnosis through follow-up within 1 year is recommended. ‘Indefinite for neoplasm/dysplasia’ (IFND) is a borderline lesion that is difficult to diagnose as either regenerative or neoplastic. Due to the diagnostic challenge following gastric forceps biopsy and as the biologic potential of these lesions is unknown, IFND lesions are classified as Category 2 according to the revised Vienna classification[1-4]. IFND is usually described in pathology reports either as regenerative atypia, atypical epithelia, or atypical gland/cells[2,5,6]. These indefinite terms are used by pathologists for cases displaying cellular architectural distortion and/or nuclear atypia that deviate from the normal but are not completely diagnostic of neoplasia. Pathologists fail to establish a definite diagnosis for reactive change, dysplasia, or carcinoma in part because of the lack of a sufficient quality and quantity of forceps biopsy specimens needed to ensure accurate diagnosis[5,7-9]. Thus, due to the possibility of dysplasia or carcinoma, follow-up evaluation according to the Vienna classification is recommended for gastric IFND cases[4,10,11]. Korea has one of the highest prevalence rates, globally, of gastric cancer[12-14]. Two previous Korean population-based studies showed that IFND lesions in the initial gastric biopsy proved to be gastric cancer in 37.6-62.5% of endoscopically resected specimens[8,9]. Although those patients were monitored for uncertain lesions endoscopically at the follow-up biopsy, difficulties in discriminating between reactive change and neoplasms even with repeated pathologic examinations remained. However, in clinical settings, no clear guideline exists that indicates the exact cut-off time for additional biopsy or endoscopic resection; additionally, there is no subsequent plan for endoscopists in dealing with more than two pathologic reports of IFND lesions at the follow-up biopsy. Thus, there is a critical need for guidance in the identification of a subset of patients through forceps biopsy, who have an IFND lesion with a higher risk of malignant potential, to enable risk stratification and optimal management. This study aimed to establish the correct diagnosis for gastric IFND lesions by evaluating a series of IFND lesions in detail and determining the key clinical and pathologic predictive factors for gastric cancer. The findings of this study may be useful in informing the decision to either perform biopsy repeatedly or resect gastric IFND lesions, and may be applicable to the prediction of gastric cancer from such lesions. Medical records and pathologic reports of patients who underwent gastric endoscopic biopsy from January 2007 to December 2016 in Hallym University Sacred Heart Hospital were reviewed for the identification of pathologically-reported gastric IFND lesions. Inclusion criteria were the presence of any terms in patient records related to atypical cell/gland/epithelium or regenerative/regenerating atypia, without a confirmative mention of ‘consistent with, suggestive of, suspicious for, or favoring dysplasia or carcinoma’ at the initial biopsy. These inclusion criteria for IFND lesions were based on the Korean pathologic grading system for gastric epithelial proliferative disease and the classification of the Japanese Gastric Cancer Association[2,3]. Records of 574 patients with follow-up data were initially archived (Figure 1); these accounted for 1.04% (574/54781) of all patients who underwent gastric endoscopic biopsy, and during the same period, 1887 gastric cancer cases were diagnosed by endoscopy. Exclusion criteria were the presence of atypical lymphoid cells in pathologic reports (n = 28), previous receipt of subtotal gastrectomy before initial forceps biopsy (n = 20), presence of a definite feature of advanced gastric cancer on endoscopy findings (n = 18), identification of IFND at the previous endoscopic gastric neoplasm resection site (n = 15), diagnosis of distant metastasis at the time of biopsy (n = 9), or loss to follow-up before endoscopic resection or surgery (n = 23). Overall, 113 patients were excluded, and a total 461 patients were enrolled in this study. 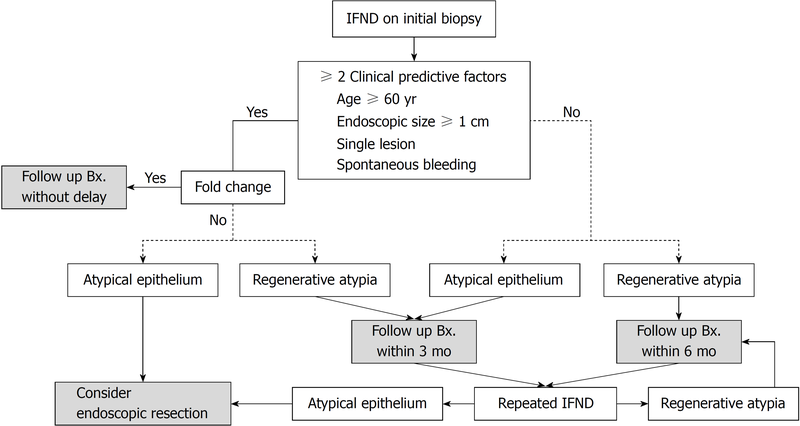 Figure 1 Flow chart of study inclusion and exclusion, and enrollment of 461 lesions with ‘indefinite for neoplasm/dysplasia’ status. The final diagnoses are shown in the gray boxes. IFND: Indefinite for neoplasm/dysplasia; ER: Endoscopic resection; Diff: Differentiated carcinoma; Undiff: Undifferentiated carcinoma. In cases with endoscopic resection or surgery, the pathologic findings and clinical data of the final specimens were examined; in the absence of endoscopic resection or surgery, the most recent endoscopic follow-up biopsy finding was considered as the final diagnosis. The 461 pathologic final diagnoses were obtained through endoscopic follow-up biopsy (n = 305), endoscopic resection (n = 134), and surgical resection (n = 22). We assessed the possible risk factors for diagnostic delays, and the potential effects of such delays on gastric carcinoma risk. The time interval from the onset of the first biopsy to the establishment of cancer diagnosis was also measured. Due to highly variable time intervals to cancer diagnosis, we dichotomized the early versus late diagnostic groups according to interval times (> 2 wk, > 2 mos, > 6 mo, > 1 year). This study was approved by the institutional review board of Hallym University Sacred Heart Hospital (IRB No. HALLYM 2018-01-003-001). The study was performed in accordance with the recommendations of the Declaration of Helsinki. As this was a retrospective study, the need for informed consent was waived. The first endoscopic photographs before the initial biopsy were collected by five endoscopy specialists (JW, DM, SE, KH, BY). The location of the lesion, endoscopic size (mm), gross type, and presence of ulcerations, multiple lesions, color change, spontaneous bleeding and converging fold were determined by experienced endoscopic specialists (HS and JS) who performed a blinded review with no knowledge of the pathologic findings. In the case of disagreement between the specialists, a consensus was determined through discussion. The endoscopic size (longest diameter) of the lesion was measured during the procedure using open biopsy forceps (6 mm when fully opened). Ulceration was defined as the discontinuity of gastric mucosa with a crater with the longest diameter > 5 mm. Multiple lesions were defined as the presence of ≥ 2 features with similar gross types and color tones around the same location. Lesion color was defined as ‘red’ or ‘whitish discoloration’ in comparison with the surrounding mucosa, and if there was ulceration, the color of the ulcer base was excluded from the assessment. Spontaneous bleeding was defined as minor bleeding (bleeding from aeration or a weak touch) caused by friable mucosa. Student’s t-tests, chi-square tests, and Fisher’s exact tests were used for comparisons between the non-carcinoma and carcinoma groups. The concordance rate with the kappa (κ) statistic was used to determine the concordance of repeated IFND diagnoses. Multivariate logistic regression analyses including significant predictors from the univariate analysis were performed, and the odds ratios (ORs) with their 95% confidence interval (CI) were determined. Survival differences between the individual groups were calculated using the Kaplan-Meier method with the log-rank test. P-values < 0.05 were considered significant. The predictive factors of gastric cancer were further evaluated using a receiver operating characteristic (ROC) curve. All statistical analyses were performed using SPSS (version 18; SPSS Inc., Chicago, IL, United States). Overall, 461 patients [319 men; 142 women; median age, 59 (range 17-91) years] were enrolled (Table 1). Of these, the diagnoses of 104 (22.6%) were confirmed as carcinoma [by endoscopic resection (79.8%, 83/104) and gastrectomy (20.1%, 21/104)] while those of 357 (77.4%) were confirmed as non-carcinoma [including 316/357 (88.5%) gastritis and 41/357 (11.4%) dysplasia]. Carcinoma lesions were significantly associated with age ≥ 60 years (P < 0.001), endoscopic size ≥ 10 mm (P < 0.001), single lesion (P < 0.001), spontaneous bleeding (P < 0.001), atypical glands reported at initial biopsy (P < 0.001) rather than regenerating atypia (P < 0.001), and repeated IFND diagnosis in pathologic reports (P=0.002). The initial endoscopic biopsy numbers were significantly higher (P = 0.013) in the carcinoma cases (2.15 ± 1.37) than the non-carcinoma cases (1.77 ± 1.13). Clinicopathologic differences between atypical epithelia and regenerating atypia were also evaluated, as shown in Supplementary Table 1. Table 1 Clinicopathologic factors of the confirmed carcinoma and non-carcinoma indefinite for neoplasm/dysplasia lesions reported at the initial forceps biopsy n (%). Dx: Diagnosis; IFND: Indefinite for neoplasm/dysplasia; Bx: Biopsy. On multivariate logistic regression, the independent risk factors predictive of gastric carcinoma in the IFND lesions (Table 2) were age ≥ 60 years (P = 0.005, OR 2.445, 95%CI: 1.305-4.580), endoscopic size ≥ 10 mm (P < 0.001, OR 3.519, 95%CI: 1.891-6.548), single lesion (P < 0.001, OR 5.702, 95%CI: 2.212-14.696), spontaneous bleeding (P = 0.001, OR 4.056, 95%CI: 1.792-9.180), atypical epithelium described as IFND (P < 0.001, OR 25.575, 95%CI: 11.537-56.695), or repeated pathologic reports of IFND (P = 0.003, OR 6.022, 95%CI: 1.822-19.909). When evaluating the four clinical predictive factors (age, endoscopic size, single lesion, and spontaneous bleeding), the overall area under the ROC curve for the diagnosis of gastric carcinoma was 0.773 (95%CI: 0.722-0.825, P = 0.026) depending on the number of clinical predictive factors. When two or more clinical predictive factors were present, the sensitivity was 91.3% and the specificity 54.9% (Supplementary Table 2). Table 2 Predictive factors of gastric carcinoma in the univariate and multivariate analyses. OR: Odds ratio; CI: Confidence interval; Bx: Biopsy; IFND: Indefinite for neoplasm/dysplasia. The 10 IFND lesion cases diagnosed as undifferentiated carcinomas (Figure 2) were associated with an endoscopic size ≥ 10 mm (P = 0.012), single lesion (P = 0.016), ulceration (P = 0.005), fold change (P < 0.001), spontaneous bleeding (P = 0.005), and atypical epithelia (P < 0.001) (Supplementary Table 3). In the histological review of the biopsied specimens, the 10 cases did not show a sufficient number of tumor cells to be confirmed as carcinoma; resected specimens of these cases showed poorly differentiated tubular adenocarcinomas mixed with signet ring cell components or well- to moderately-differentiated adenocarcinomas, within a single lesion. Figure 2 Representative cases of undifferentiated carcinoma. Flat lesions with color change (A-C) and fold change with ulcerations (D-F) are shown at endoscopy. G: The case in panel A shows a few tumor cells (magnified in the inlet) in the endoscopic biopsy specimen (black arrow). H: The resected specimen shows poorly differentiated tubular adenocarcinoma with a very small tumor size (0.7 cm × 0.6 cm). I: The case in panel B shows a few tumor cells in the endoscopic biopsy specimen (black arrow). J: The resected specimen shows mixed signet ring cell carcinoma and poorly differentiated tubular adenocarcinoma with a very small tumor size (0.6 cm × 0.4 cm). K: The case in panel e shows a few tumor cells as squeezing artifact-like clusters in the endoscopic biopsy specimen (black arrow). L: The resected specimen shows mixed poorly differentiated (dotted arrow) and well-differentiated (red arrow) tubular adenocarcinoma. The 29 IFND lesion cases were diagnosed as ‘poor prognosis carcinomas’ (undifferentiated or invasive carcinoma in the submucosal layer or deeper). In the subgroup analysis of the carcinoma group, poor prognosis carcinomas were significantly associated with the depressed gross type (P = 0.034), ulceration (P = 0.010), and fold change (P = 0.001) (Table 3). Fold change was the only independent risk factor (OR 5.594, 95%CI: 1.458-21.462; P = 0.012; Table 4) for the prediction of poor prognoses in carcinoma. Table 3 Clinicopathologic factors of poor prognosis carcinoma in the subgroup analysis of the carcinoma group n (%). Table 4 Predictive factors of poor prognosis carcinoma in the univariate and multivariate analyses. The mean time interval from initial biopsy to the final diagnosis of carcinoma was 116.70 ± 324.46 d (median 27 d). The follow-up period ranged from 2-127 (mean 36.1 ± 30.0) mo (Table 5). Except for the fact that the rates of additional surgical treatment (P = 0.033) and incomplete resection (P = 0.031) were significantly higher in the early diagnostic group within 2 weeks, there were no statistically significant differences in tumor differentiation, tumor pathologic size, invasion depth, lymphovascular invasion, complete resection status, additional surgery, recurrence, or endoscopic suspicion for carcinoma between the early and late diagnostic groups. Regenerating atypia lesions at initial biopsy were significantly associated with the late diagnostic group, while a larger number of atypical epithelium lesions were included in the early diagnostic group (> 2 mo and > 6 mo) (P < 0.001). The late diagnostic group had repeated pathologic results of IFND, while the early diagnostic group did not. Initial endoscopic suspicion for carcinoma was related to early diagnoses (≤ 2 wk and ≤ 2 mo, P < 0.001 and P = 0.016, respectively). Table 5 Diagnostic delays in gastric carcinoma and the clinicopathologic correlation n (%). Bx: Biopsy; IFND: Indefinite for neoplasm/dysplasia; LVI: Lymphovascular invasion; AGL: Atypical epithelium; RegA: Regenerating atypia; Differ: Differentiated adenocarcinoma; Undiffer: Un-differentiated adenocarcinoma. The recurrence-free survival rates were not statistically different between the early and late diagnostic groups with the criteria of 2 wk, 2 mo, 6 mo, or > 1 year (P = 0.280, P = 0.848, P = 0.283, and P = 0.283, respectively; Supplementary Figure 1). IFND lesion diagnoses were observed more than twice in 24 (5.2%) of the 461 cases (Table 6). Of the 24, the final diagnosis for four cases (16.7%) was adenoma, while 12 cases (50.0%) were diagnosed as well-differentiated adenocarcinoma and the remaining eight (33.3%) diagnoses were of chronic gastritis with reactive change. Table 6 Retrospective prediction rate for the final diagnosis of 24 cases of repeated indefinite for neoplasm/dysplasia by five pathologists in a blinded H and E slide review. H and E: Hematoxylin and eosin; IFND: Indefinite for neoplasm/dysplasia; Bx: Biopsy; Dx: Diagnosis; W/D: Well-differentiated adenocarcinoma; A: Accuracy; C: Concordance; AGL: Atypical epithelium; RegA: Regenerating atypia. The first two biopsies and the final slides of the 24 cases were independently reviewed by five pathologists blinded to the case information. The diagnostic accuracy of the first biopsy was 75.0% for gastritis, 78.3% for adenoma, and 65.0% for adenocarcinoma. The accuracy of the second biopsy was 60.8% for gastritis, 84.2% for adenoma, and 63.3% for adenocarcinoma. The diagnostic concordance for adenoma and adenocarcinoma showed statistically substantial agreement between the first and second biopsies (κ = 0.733, P = 0.001; κ = 0.415, P = 0.001, respectively), whereas that of gastritis showed no statistically significant agreement between the first and second biopsies (κ = 0.117, P = 0.463). Therefore, overall concordances between pathologists in the review of IFND lesions were 50% for gastritis, 66.7% for gastric adenoma, and 50.7% for gastric cancer. Two cases failed to be diagnosed as cancer in both the first and second biopsies by all five pathologists. In the biopsied specimens, focal glandular crowding and angulated glands were noted with glandular transition to the surrounding surface mucosa, characteristic of low cytologic atypia, but the structural atypia did not reach the diagnostic criteria of overt carcinoma. In the endoscopic submucosal dissection specimens, the histological geography of the entire lesion showed moderate-to-severe inflammatory infiltration, adenoma, and carcinoma, within a single lesion. The full epithelial layer view of the lesions confirmed well-differentiated adenocarcinoma (Figure 3). 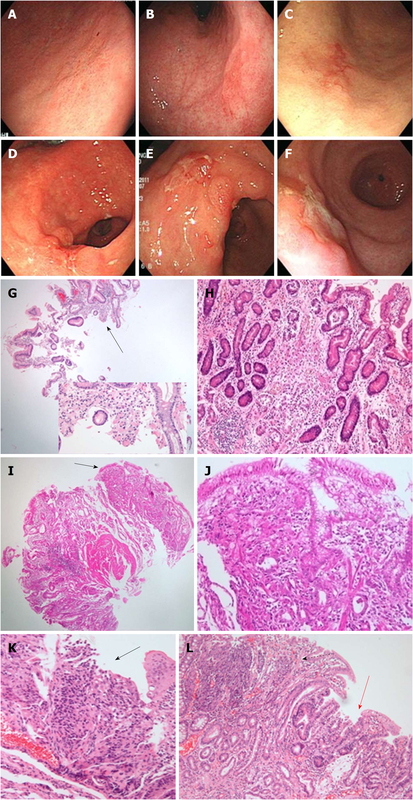 Figure 3 Representative images of Indefinite for neoplasm/dysplasia lesions with repeated diagnoses (from regenerating atypia to atypical epithelium), which were finally confirmed as well-differentiated adenocarcinoma at endoscopic submucosal dissection. A: A lesion with mucosal irregularity and hyperemia is seen on the lesser curvature side of the prepylorus (indicated by arrows). B: After endoscopic submucosal dissection, the yellow line illustrates the boundary of the lesion confirmed in the pathology, measuring 1.7 cm × 1.0 cm. C: Regenerating atypia at the initial forceps biopsy shows focal glandular crowding with a basally-located, hyperchromatic nucleus. Glandular transition to the surrounding mucosa is observed. D: Atypical epithelium at follow-up biopsy after 598 d shows more crowded and tortuous glands. A few glands showed irregular distention. However, the hyperchromatic but basally-located nuclear atypia was mild. E: Endoscopic submucosal dissection was performed 2249 d later. It revealed well-differentiated adenocarcinoma. The low-power view shows surface maturation. F: The neoplastic tubules were prominent from the mid-portion of the tubular pit to the bottom of the gland; G: They form crowded, back-to-back, branched, and tortuous glands with disordered nuclei; H: Surface atypia is less prominent and mild nuclear atypia is observed. IFND: Indefinite for neoplasm/dysplasia. In this study, approximately one-fourth of all IFND lesions at the initial biopsy were finally determined to be gastric cancers by endoscopic resection (79.8%) and gastrectomy (20.1%). Repeated IFND lesion diagnoses were uncommon (5.2%), with 50% cases exhibiting well-differentiated adenocarcinoma, and 16.7% and 33.3% confirmed as adenoma and gastritis, respectively. The carcinomas were usually diagnosed by resection, indicating that repeated biopsies did not detect the majority of cases. We found 24 repeated IFND lesions that displayed structural abnormality with mild cytologic atypia; half of these cases were extremely well-differentiated adenocarcinomas. Among them, two extremely well-differentiated adenocarcinomas could not be diagnosed at both the first and second biopsies in the blinded evaluation by all five pathologists. The high degree of differentiation and mild cellular atypia of these lesions resulted in frequent diagnostic difficulties, even at repeated biopsies, due to the surface maturation that mimicked intestinal metaplasia. These were frequently described at the endoscopic biopsies as ‘indeterminate for neoplasia’ (26%) or ‘reactive intestinal metaplasia’ (24%). Within this context, the diagnostic rate of adenocarcinoma, which was the lowest, did not increase despite repeated biopsies. Previous studies have also raised this concern, with 30-50% of the original diagnostic biopsies incorrectly interpreted[21-23]. Likewise in this study, the overall concordances between pathologists in IFND lesions were not satisfactory (50-67%). However, the problem of interpretation lies not in the ability of the endoscopist or pathologist, but in the structural and cytologic features of the lesion. Given the low diagnostic rate of highly differentiated gastric cancers, it is very important for clinicians to provide a comment in the pathology report indicating architectural atypia with mild nuclear atypia. This can act as a reminder for endoscopists to consider the possibility of malignancy. 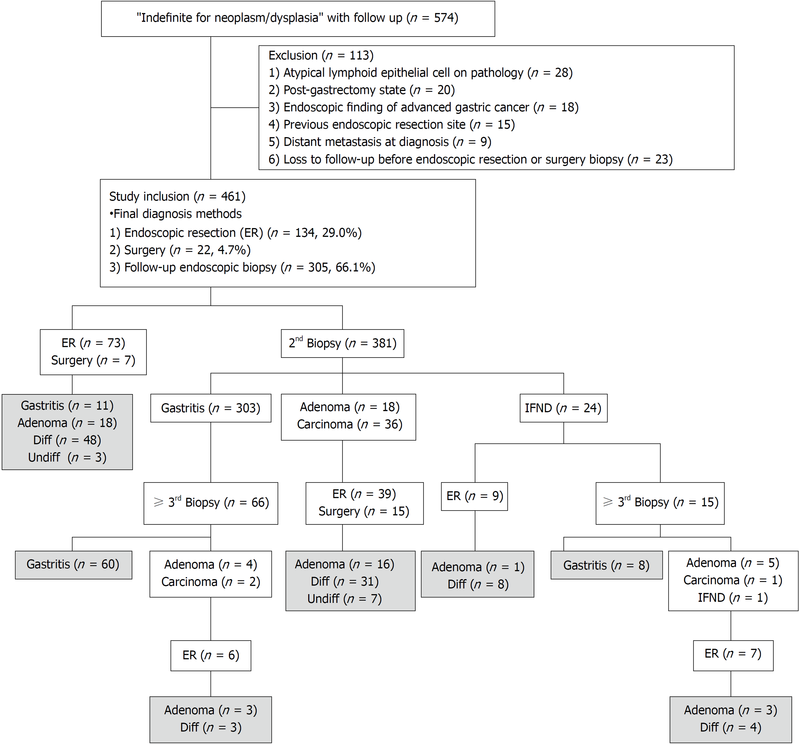 The adenomas in this study showed the highest diagnostic rate and the most concordance in repeated biopsies; this indicates that repeated biopsies may be helpful in confirming gastric adenoma, in contrast to gastric cancer cases. However, we also found that gastritis with reactive change was correctly diagnosed despite the fact that repeat biopsies were inconsistent and showed the highest intra-observer and inter-observer variabilities. This indicates that regenerating epithelium is truly difficult to distinguish from carcinoma even in retrospective reviews by experienced pathologists. The overlapping histologic features of cribriform, villous/papillary structures, intraluminal papilla, thick irregular membrane, and vesicular nuclei considered to be beyond the upper spectrum of dysplasia were also observed in regenerating atypia cases. Gastritis was diagnosed in 11/80 cases (7.2%) after immediate endoscopic resection; this is similar to the false-positive rate (7.5%) observed in a previous study. Although immediate endoscopic resection is considered an excellent method for IFND diagnosis[9,24], this strategy should be carefully considered as a risk for false-positive reactive change. This is because the reactive changes after medical therapy showed an unequivocal non-dysplastic epithelium. Sampling bias and intratumoral heterogeneity, ranging from reactive change and adenoma to carcinoma, may be attributable to such discrepancies. However, sampling errors or insufficient biopsy volumes due to biopsy alone may not fully explain these discrepancies[25,26]. Similar to our results, previous studies have shown that the number of initial biopsies is not positively correlated with the diagnosis of carcinoma in IFND cases[8,9]. Delayed diagnosis due to repeated atypia may be partially attributed to endoscopically-equivocal macroscopic findings. Therefore, it is of clinical importance for endoscopists to predict the possibility of carcinoma when IFND is encountered in pathologic reports. Yu et al reported that an endoscopic size ≥ 10 mm and the presence of depressed lesions are independent risk factors of gastric cancer in atypical epithelium lesions. Red discoloration and friability in IFND lesions are also associated with a final neoplastic diagnosis. In contrast, some studies reported that endoscopic size, gross appearance, lesion location, number of biopsies, and Helicobacter pylori infection in gastric IFND are not predictive of gastric cancer following resection. In this context, it is recommended that endoscopic resection be considered for cases with endoscopically worrisome findings (a single lesion size ≥ 10 mm and spontaneous bleeding). Additionally, in the subgroup analysis of carcinoma, fold change was observed to be a clinically independent predictive factor for undifferentiated or invasive carcinoma in the submucosal layer or deeper. Limited attention has been paid to the validity of the follow-up strategy for this indefinite pathology, and to the association between diagnostic delays and worsened prognosis. In this study, we did not observe a prognostic impact of prolonged diagnostic delay on the final diagnosis of gastric cancer in either the early or delayed diagnostic groups (> 2 wk, >2 mo, > 6 mo, and > 1 year). The overall prognoses were favorable in both groups. This could be explained by the fact that those cases were finally confirmed as well-differentiated early gastric cancers. The delayed diagnosis for gastric cancer did not affect the increased tumor size, invasion depth, lymphovascular invasion, incomplete resection status, additional surgery, or recurrence in gastric cancers. Indeed, a delayed diagnosis after > 1 year of well-differentiated gastric adenocarcinoma is likely to have limited prognostic consequence because the lesions are slow-growing[21,22]. This is supported by the low Ki-67 labeling index and the lack of p53 overexpression[22,27]. Those lesions show minimal changes in size between the first examination and at resection and remain intramucosal cancers even after 84 months at endoscopic resection from the initial biopsy. However, because the endoscopically-suspected gastric cancers in our retrospective study tended to lead to earlier diagnosis and resection than endoscopically-undetermined lesions; thus, less-aggressive gastric cancers may remain undiagnosed or have a delayed diagnosis, our results of no prognostic differences between the early and late diagnosis groups might be due to the possible selection bias. Therefore, our findings concerning the prognostic impact of prolonged diagnostic delays in indefinite lesions should not be considered conclusive and further prospective studies are necessary. As a result of this study, our institute established a guideline for future prospective research (Figure 4). The guideline is based on the following: (1) two pathologic risk factors (atypical glands and repeated IFND) are strongly associated with gastric cancer, (2) more than two clinical risk factors (age ≥ 60, endoscopic size ≥ 10 mm, single lesions, and spontaneous bleeding) are determined to have a significant cut-off value for gastric carcinoma diagnosis, (3) fold change predicts undifferentiated or invasive carcinoma in the submucosal layer or deeper, and (4) considering that IFND lesions of Barrett’s esophagus are recommended for follow-up within 3-6 mo  and that diagnostic delays within 1 year had no effect on prognoses in our gastric IFND cases, follow-up biopsy for IFND should be performed within 6 mo. Figure 4 The guideline established in our institute for ‘indefinite for neoplasm/dysplasia’ in gastric biopsy. Bx: Biopsy; IFND: Indefinite for neoplasm/dysplasia. Our study has some limitations. This was a retrospective, correlative study in a single center that was not based on a trial and lacked strictly regulated, periodical follow-up data or data on H. pylori infection and intestinal metaplasia. There may be a selection bias enrolled in a single, tertiary medical center located at the gastric cancer-endemic country. Nevertheless, our study has some strengths. This is among the rare reports describing the clinicopathologic features associated with repeated IFND diagnosis; the features of undifferentiated cancer initially diagnosed as IFND; and the correlation between diagnostic delays and IFND prognoses. These findings may enable the definition of high-risk malignant potential and therapeutic strategies. The prediction of gastric cancer may be reliable in ambiguous lesions in patients aged ≥ 60 years, with endoscopic lesion size ≥ 10 mm, with single lesions, with lesions that show spontaneous bleeding, and with atypical glands or repeated IFND diagnosis. In single lesions with these features, endoscopic resection would be a better option than repeated endoscopic biopsy. Otherwise, without any associated risk factors, accurate diagnosis through follow-up endoscopic biopsy within 1 year is recommended and will likely not worsen long-term outcomes. Gastric ‘indefinite for neoplasm/dysplasia’ (IFND) is a borderline lesion that is difficult to diagnose as either regenerative or neoplastic. Thus, due to the possibility of dysplasia or carcinoma, follow-up evaluation according to the Vienna classification is recommended for gastric IFND cases. However, in clinical settings, no clear guideline exists that indicates the exact cut-off time for additional biopsy or endoscopic resection; additionally, there is no subsequent plan for endoscopists in dealing with more than two pathologic reports of IFND lesions at the follow-up biopsy. There is a critical need for guidance in the identification of a subset of patients through forceps biopsy, who have an IFND lesion with a higher risk of malignant potential, to enable risk stratification and optimal management. Our study aimed to establish the correct diagnosis for gastric IFND lesions by evaluating a series of IFND lesions in detail and determining the key clinical and pathologic predictive factors for gastric cancer. The findings of this study may be useful in informing the decision to either perform biopsy repeatedly or resect gastric IFND lesions. Medical records and pathologic reports of patients who underwent gastric endoscopic biopsy from January 2007 to December 2016 were reviewed, and a total 461 IFND lesions were enrolled in this study. Two gastrointestinal pathologists confirmed all cases as IFND lesions according to standard guidelines (the Korean pathologic grading system for gastric epithelial proliferative disease, the classification of the Japanese Gastric Cancer Association, and the Vienna classification), and IFND lesions were divided into two subgroups: ‘atypical epithelia’ and ‘regenerating atypia. To assess the possible risk factors for diagnostic delays, the time interval from the onset of the first biopsy to the establishment of cancer diagnosis was measured. At initial biopsy, ‘indefinite for neoplasm/dysplasia’ (IFND) lesions proved to be adenocarcinomas (22.6%). Independent risk factors for gastric IFND cancer were age (≥ 60 years), endoscopic size (≥ 10 mm), single lesion, spontaneous bleeding, atypical epithelia, and repeated IFND diagnosis. Additionally, fold change predicted undifferentiated or invasive carcinoma in the submucosal layers or deeper. Diagnostic delays shorter than 1 year were not associated with worse prognoses in our study. However, there may be a selection bias enrolled in a single, tertiary medical center located at the gastric cancer-endemic country. More than two clinical and pathologic factors each had significant cut-off values for gastric carcinoma diagnosis; in such cases, endoscopic resection would be a better option than repeated endoscopic biopsy. Otherwise, without any associated risk factors, accurate diagnosis through follow-up endoscopic biopsy within 1 year is recommended and will likely not worsen long-term outcomes. As a result of this study, our institute established a guideline. And we will use this guideline to conduct future prospective studies to reduce selection bias.